By the early nineteenth century, meteorologists were equipped with plenty of useful devices: barometers, thermometers, hygrometers, and any number of variations thereon. But the nature of these instruments was not wholly understood. While it was possible to take accurate measurements with a barometer, what physical process made the mercury move? What exactly is atmospheric pressure? And how can one measure sunlight? 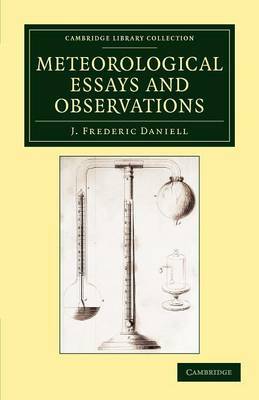 Ranging from wild theories of gravity-resistant air particles to the latest experiments in altitude, chemist and physicist John Frederic Daniell (1790-1845) presents his answers in this collection of essays. First published in 1823, this enlarged second edition of 1827 includes his work on the climate of London, the effect of atmospheric conditions on human health, and suggested improvements for the design of a new hygrometer. Daniell later became the first professor of chemistry at King's College, London, and foreign secretary of the Royal Society.